With the ongoing construction of about one-kilometre farm road in Jamkhar village of Trashi Yangtse, some farmers say it is affecting their paddy fields located below the area. 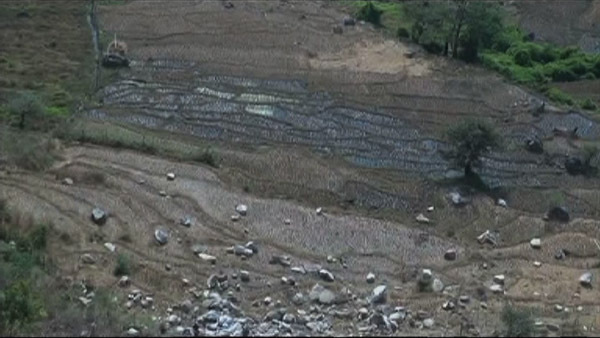 The falling boulders and landslides have already damaged the field of one of the farmers. “My paddy fields are filled with debris. When they came to get clearance they assured us that our fields won’t be affected. That is why we gave our consent,” Kunzang said. About 40 farmers own paddy fields below the farm road construction and they are worried that it might affect their paddy fields. “We were told that the debris from the construction would be transported in tripper trucks and the fields won’t be affected. But today our fields have become uncultivable,” Wangchuk, a farmer, said. “I was worried that the fields would get affected since we have to solely depend on farming. With no land elsewhere, I did not give my consent,” Ugyen Norbu, another farmer, said. Meanwhile, the gewog administration says since the fields are located just below the construction site, debris and boulders are bound to fall into some of the fields. They added they will, however, clean and restore the fields. “We have informed the people that we will restore the affected fields. When we had acquired the social clearance from the public, we assured the farmers that the gewog will help them in solving the problems,” Karma Tshewang, the Jamakhar Gup, said. He added that the priority was given to constructing the farm road in the Jamkhar with the repeated request from the people. The farm road is being constructed at a cost of about Nu 1.5 M. Moreover an irrigation channel is also expected to be constructed alongside the new farm road.